Special Note: Since having this in 2012, it fast became one of my favorite pumpkin beers as did its more recent brother-in-arms, Warlock. Southern Tier’s Warlock is a spiced pumpkin stout that is a darker, roastier, maltier counterpart to Pumking that isn’t released until September. I mention Warlock because I highly recommend creating a Pumking/Warlock blend, referred to as Warking. For more information on this, check out my video on this very topic here: Pumking vs. Warlock and Warking. Appearance: Pours with a mild fizzy and thin film of tiny bubbles that lasts for a few seconds. I’m using a wide-mouthed goblet, so this beer doesn’t stand a chance of developing a head. The core color is a lighter caramel/orange that doesn’t quite reach copper. The edges are yellow and verge on the straw color of Pilsners. A clear, almost haze-less body shows a few bubbles zip to the surface. Swirling coats the glass with sudsy bubbles and a clear slickness. Aroma: A bomb of graham cracker pie crust and vanilla dominates the nose. Sweeter roasted nuts linger in the background and there is just a wisp of nutmeg and all-spice that mixes with the stronger graham cracker. Earthy pumpkin hangs out underneath the sweeter elements but is a little difficult to pick out for someone that doesn’t sit around with a jack-o’-lantern on their head. This blends into a nicely balanced “pumpkin pie in a glass” type beer that avoids over-spicing in my opinion. Those that want more beer-centric aromas to mix with the spiced up elements will probably be disappointed. Taste/Mouth Feel: The mouth feel is probably where I’m most letdown by the 2014 version. The carbonation is fairly low with a medium body. Not bad, but when I first had this, the mouth feel was a bit heavier and had a creaminess that worked well with the pumpkin pie attributes. The malt, vanilla, graham cracker, and spices mix well to create a soft, yet robust flavor without delving into desert beer territory. This years is smoother with less bitterness and a lighter malt body, reminiscent of a pale ale, allowing the pumpkin to come through more. I imagine that many that did not care for the intensity of past iterations of Pumking and will appreciate the toned down qualities. The graham cracker is front and center, being featured along with the sweeter malt. The vanilla have been pushed into the background this year, making for a better balance overall. Personally, I love vanilla in beers and was really into the vanilla-forward aspect of this beer. The change does allow the yummy graham cracker to take a featured spot on the tongue, so it’s a fair trade-off. One of the bigger changes to the flavor profile is in the finish. The main body of the beer finishes quickly, leaving the flavor of pale malt and doughy bread to linger. Some heat comes along for the ride and coats your mouth with warm spice. The alcohol intensifies the cinnamon and nutmeg, although still timid compared to some pumpkin beers, and cuts out the bitterness that was featured in the finish of the 2013 version. The finish of the 2014 version is an improvement, with my wife, a former disliker of Pumking, commenting on how much better it is this year. 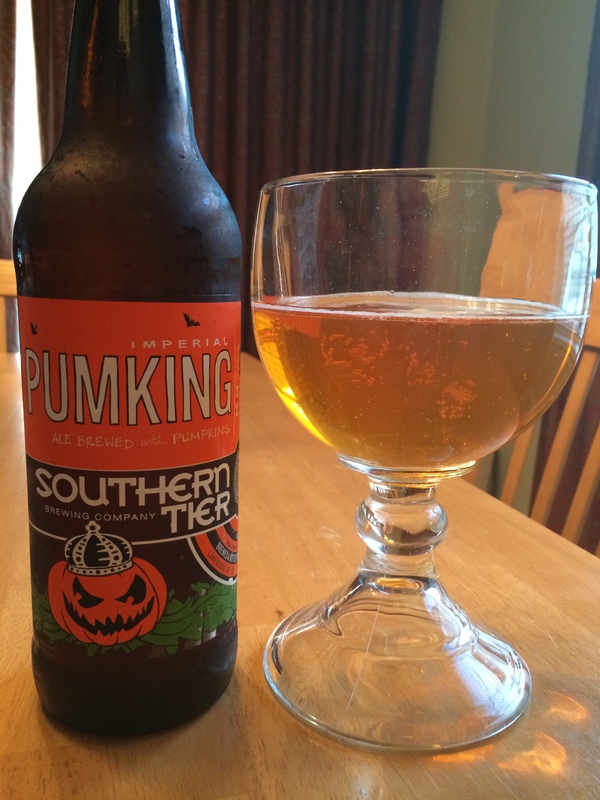 Final Thoughts: I think Southern Tier listened to some of the criticisms of Pumking and tweaked the recipe. The heart of this is still the Pumking fans know and love, but with the rough edges shorn off to make it a more casual friendly beer. The vanilla has backed off and the flavors are better blended than in previous vintages, but the cinnamon nutmeg mixes well with the intense graham cracker that makes this a hit with me. The overall profile of this beer seems to be lighter, possibly to create more of a separation between Pumking and Warlock, and to make this a more drinkable beer for the summer months. The Pumking detractors aren’t going to change their tune nor will this win over those that want the pumpkin front and center, but someone on the fence may find this year’s version to be a pretty enjoyable fall treat (or summer patio/fire pit drinker).